It’s been a whole month since the Departments for Transport and Communities and Local Government moved over to GOV.UK. That kicked off a process which will see around 300 departments and agencies joining the site by April 2014. Today 11 more organisations will be moving to GOV.UK, including big names like the Ministry of Defence and Foreign Office. All this means lots more policies, lots more content, and lots more users for Inside Government. You might want to take a look at the posts BIS and FCO have written on their own blogs about the move. Today we've published 40 policies on a dozen topics, taking our total up to 72 policies on 25 topics now live on Inside Government. It's a hefty jump. In our previous release there were several examples of policy information from DCLG and DFT appearing side by side on shared topics (such as policies from both departments contributing to economic growth). With this release we've gone further, introducing a number of shared policies where different departments are working together to achieve the same outcome. This has meant working with policy teams across multiple organisations to produce a single policy document that describes a cross-government approach. 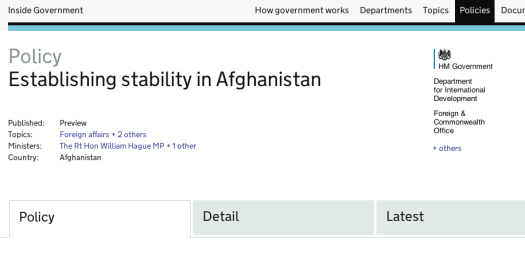 Government's policy on Afghanistan is one example. Producing this policy page involved experts from MOD, the Cabinet Office and FCO, supported by people in those departments' digital teams who had already helped to shape what policy would look like on GOV.UK, working together to draft a single, clear document for people interested in everything the government is doing on this issue. It's been really exciting to see that take shape over the last few months, and Janet will be telling you more about that process in the next few days. In most cases, today's release marks the full migration of content from each organisation over to GOV.UK. But we've got more work to do to bring across all the content from the FCO - namely their popular travel alerts and mainstream information, and the hundreds of multi-lingual sites about the UK government's presence, activities and priorities around the world. Until then, information about what FCO is doing internationally can still be found from this page and travel advice remains here. Next up - more of the same. We're aiming for the end of March to move another 18 ministerial government departments over to GOV.UK, and we're already working with the next wave of departments to make sure everything's ready.